By stayhomecupcake on September 12th, 2011 . Filed under: Cupcake Ideas, Decorating, Giveaways, Wedding . I would add a coordinating ribbon to each shelf edge to dress it up a bit. I would decorate it with cupcakes of course!!!! I love to fill in with colored tulle to match whatever cupcakes I make, it adds an extra flair. And maybe some decorative cupcake picks on the top layer depending on the cupcake design. These are awesome. So much better than the flimsy wire cupcake holders you often see. This is exactly what I’m looking for! I would decorate it seasonally – for fall I’d love to do an orange and gold ribbon around the edges and use some fun fall themed decorate cupcake wrappers. Perhaps even decorate with some pumpkin cupcakes! My sister is pregnant and I am throwing her a baby shower soon and so I would decorate in pinks and little baby decorations! I’d use pink and black scrapbook paper and edge the cupcake stand with pink and black ribbon! Halloween all the way!!! nothing beats halloween decorated cupcakes. I would paint it black and purple, add some spider webs, fake spiders, a little glitter, and great big giant orange cupcake on top!!! I would love to make it into a Christmas tower! That is when i go crazy baking and it would be fabulous to have something so festive to show off my delicious creations! I would decorate it with flowers, my daughters 1st birthday is in October and we are doing a very girly flower theme. 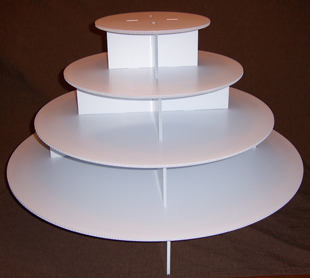 This cupcake stand would be great for her party!! I spray it black the stand and decorate my cupcakes with neon pink frosting. Fantastic invention! I would make it bright pink and turquoise, and deck it out with tons of cupcakes of course! I would use this for my upcoming wedding. I would spray paint it my wedding color (turquoise) then put rhinestones in a row around the rim of each layer. Of course the final decorating detail is the gorgeous cupcakes we’ll have! The baker wants a ridiculous amount just to RENT a cupcake stand, this way I’d be able to use reuse if for parties and gatherings also! I would also decorate it seasonally. Halloween is my favorite holiday so I would start there with some orange, black, purple and bright green ribbons. I love those colors together for Halloween and add some plastic spider rings to dress it up. It would also be really nice for Christmas with a red, green and white theme!. These cupcake towers are wonderful! With college football starting up and college basketball just around the corner, I’m definitely going to have to get one to paint Carolina blue for cupcakes (and even other desserts!) to cheer on my Tar heels. I would Velcro ribbon around the edges so I could change it for each event. This would be perfect for my new cupcake business I just started this month! I would paint mine black and white….classy, and you could always throw in pops of color and make it work for almost any occasion! These Cupcake Towers are awesome just because you can change the decoration for every occasion. Because of the name I think the Emperor Cupcake stand would be great to decorate with ice made from gum paste, cotton candy-snow and of course Emperor Penguin Cupcakes. I would love to make a gum paste ice slide from top to bottom with gum paste penguins going down the slide: would be so much fun! What an amazing product! I would love to use this during my annual Halloween party. I would spray paint them black, and then top each tier with coordinating scrapbook paper and finally bling-out the edges with ribbon and rhinestones! Some fabulous pumpkin and chocolate chip cupcakes would be perfect! I would love to have this halloween. I’d paint it black, cover and cover it with cobwebs and spiders. A cauldron perched on top with some dry ice would be perfect. Thanks for the awesome giveaway! But my first theme for this tower [if I won *crosses fingers*] would be PURPLE. [yes in ALL CAPS] and lay out each layer with a satin purple fabric. The cupcakes will be PURPLE cupcakes w/ PURPLE frosting. Then is shimmered with a silver glitter powder so it can have to type of shine. And at the top of the tower will be a HUGE PURPLE Cupcake Cake with silver glitter shimmer powder as well. GENIUS! ^_^ It puts a smile on my face just thinking about it. I would use ribbon to coordinate with cupcakes that I display on them. I think the cupcake tower material would handle using ribbon adhered with hot glue (cold sticks) and could peel off easily to use again and again. OMG! I love these. I have a couple baby showers coming up that I am hosting with my husband and mom. I would probably use ribbon to decorate the edges and make for a clean centerpiece to a dessert table! Rhinestones. Lots and lots of rhinestones and fresh flowers. EJ’s birthday, this coming year he will be 9 and the theme is Mad Scientist! First wrap the edges of each layer with ribbon, using a lace ribbon. With Halloween coming I would use an orange one on opposite tiers then black on the others. Using special cupcake wrappers for Halloween. I would also put a fake spider web all along the edges along with edible spiders. Christmas is just around the corner….so lots of fun glittery decorations would be fun to add to this cupcake tower!!! I would airbrush it in a very festive holiday theme since the 3 biggest holidays are coming up soon ! I would do all different neon colored cupcakes with peace sign ribbon accents with a mega sized Neon tye dyed looking cupcake on the top teir. This would be for my daughters who are tye dye and peace sign freaks! I’d go for a Halloween theme with black paint, maybe some black glitter, and a cute Halloween trim around the edges of each tier. i would love this i want cupcakes at our wedding so bad. I would love to have a tower to display my cupcakes. I would decorate the display to compliment the event. Not to overpower with decorating but to enhance the display with the main feature to be the beauty of the cupcakes of course ! I would cover the flat surfaces with velcro the flat surfaces with white velcro pads and use velcro dots on the bottom of the cupcake liners to keep them in tact. I love tulle and chandeliers so I’d velcro the sides so I can attach tulle on each tier’s edge or wrap a velcro ribbon of beads to hang down the sides. 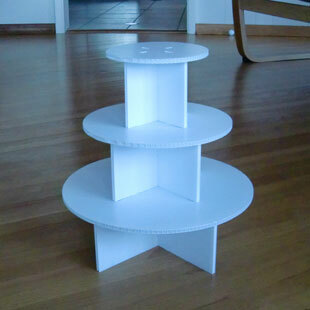 I’d make a coordinating cake to put on the top tier of this stand. This would be perfect in my new cupcake business! I would decorate this in a hollywood glam style to match my movie theme wedding reception. I’m thinking spray painted with black glitter spray paint, trimed with beaded jewels and accented with feathers. Cupcakes of course with a touch of red garnish on them for the pop of color! Oh I would use this ALL the time!! Kids birthday parties and baby showers!! Could decorate this all kinds of ways. My daughter Loves cupcakes and has already ask for me to make her some for her birthday this would be great. Of course her favorite color is pink and purple so I would have puploe fabric under the pick cupcakes and pink fabic under the purple cupcakes. I am doing a Candyland theme for my niece’s 1st birthday soon, so I would love to use this and decorate it with all different kinds of candy attached to it….gumdrops, gummy bears, sour balls etc. I would put bright pink, blue, yellow and orange cupcakes on it for an amazing display! Then I would cover it all with edible glitter to make it extra special. I’m making cupcakes for 80 guests, for a friend’s parents 25th wedding anniversary. I have never made that many cupcakes before, and I agreed before I thought about it, I realised I’d need something to display them, so all day today I’ve been hunting for cake stands and D.I.Y seems the best option. I was planning on decorating each tier with a pretty silver wrapping paper and I found adorable 25th Anniversary ribbon in white and silver which I’d line the edge of the tiers with, I’d probably top it of with some white roses dotted among the cupcakes, because flowers and cake = perfection :). Then I saw this contest posted on Facebook and thought it must be my destiny to enter! I would decorate it with fabulous cupcakes for my nephew’s 6th birthday that’s coming up! I like polka dots! Then add some ribbon around the edges coordinating like colors! I would be so excited to win this! I am in the middle of planning a Winter Wonderland Baby Shower (for a girl!). Let me tell you — not too many items to buy for decorations. I need to be extra creative. My next project is how I am going to display my snowflake cupcakes. This would be perfect with silver and pink! Then once the baby shower is over I can use it for every holiday and event I can possible imagine. I have an embroidery machine so I could easily decorate for all the holidays with fabric! Thanks for the chance to win! I would decorate this stand with scrapbook paper covered with clear contact paper so it could be switched to match different occasions. On the outside edges I would put ribbon to match paper theme and occasion. The ribbon could also be changed to match theme! The stand would be used for many special moments and occasions!!! I would finally love to have a stand for all of the events I have at my house. I make cupcakes all the time & would like a way to display them with an amazing display. Next up is my Wedding anniversary/Halloween party So I’m thinking A little glitter and spider webbing would be a GREAT way to decorate the display. Oh my goodness!! I NEED this!! My best friend is getting married in October and I agreed to make the wedding cupcakes. We’re all on a tight budget and we were going to make our own stand, but this would be PERFECT!!! Her gown is red, so we would use a matching shade of paper to cover each shelf, and we would cover the edges with rhinestones for the bling! I would LOVE to have this for my engagement party next month! I would decorate it in a beautiful Dia de los Muertos theme with mariposa (butterflies) in bright colors and mini tissue paper flowers. I would decorate it with black and white ribbons, rhinestones and damask paper for my son’s wedding in Dec. I would love to win this. <3 them! I’m looking at decorating it for all fun holidays, special events!!! I would love to win this!! This would be an awesome center piece!! would to decorate it my for my parent 50th wedding anniversary! I would cover it with all differnt cupcakes and decorate with ribbon and confetti! I would also add balloons. For a local high school school function, each shelf of cupcakes will represent the colors in the board game The Game of Life: Purple, Blue, Green and Orange. Adding some extra flair the bases of each shelf will have a paper replica of the board game. Board pieces will be created and placed throughout the tiers. I would let my lovely cupcakes be the decor!! I would decorate it with everything that is pink and girly for my daughter’s 5th birthday. Rhinestones, jewels, ribbon and sugar crowns to match. She would be in heaven. I would love to use this stand for my daughters 1st birthday. I’m doing a sesame street theme and it would be adorable with different character cupcakes on each tier! This cupcake shelf is faboosh! Halloween/ Neewollah is fast approaching, so party planning is a must. I could turn each shelf into a spooky subject with cupcakes. Ghosts, and witches, and demons. Maybe even go with a haunted movie them for each tier to wow your guests at your spooky party! Perhaps, beetlejuice, and other Tim Burton movies! I would spray paint it pink and decorate it with flowers and ribbons and a little plastic tea set. My daughter is going to be 6 on Thanksgiving Day and we are having a Tea Party! This would be Perfect! I would definitely use their recommendation and use wrapping paper and ribbon to decorate it. Changing the theme to match the cupcakes would be easy! I love the picture with the flowers stuck in between the cupcakes too. Such a great idea! And so cute! I would bling it out!! My daughter is having her quince (15th birthday) next year and this would make a perfect centerpiece for her candy table holding all of her lovely cupcakes!! Keeping the cupcake designs the main feature you cannot overwhelm the display with too many features. However, a properly accented display is the icing on the cupcake to your finished product of a tower design. For an elegant wedding we would match a trim to the wedding – rhinestones or ribbon or feathers or leaves (in season of course). We may even cover the plates to further match a color theme if we didn’t need a stark white look. Adorn the stand top center with flowers, cupcake with a monogram pick for the couple, or other accents that provided a proper “topper” look the the cupcake tower for a wedding! So many many options – this is a nie versitle piece that we would love to work with! Thanks for the opportunity to allow us to share ideas. Halloween is fast approaching! (and my FAVORITE holiday) I would do a gingerbread haunted house on the top. Each shelf would hold cupcakes with an individual figure on each made of marzipan. Each character would be a different trick or treater. This would be amazing to have and very easy to change for each theme! I would do it up girly!! I make the birthday cakes for my 11 yr old daughter and all of her friends! Pink and green, glittery, sparkly. Those are some of our fave colors! I love that stand and I would paint it brown so the cupcakes would standout. Then I would drill a small hole on the top because to personalize flowers, desserts or anything I make a wand using fun paper, stamp edging, glitter. rhinestones and stamps that says”Happy Birthday Bella” or whatever. Then I tie fluff with ribbon around it. This way you can personalize and reuse the stand for every occasion. if I win I would love to photograph it, what a great prop. I would decorate it with christmas ribbon and mini ornaments for my annual Christmas party. I would decorate my Cupcake Tower in Purple for Pancreatic Cancer and fill it with cupcakes! I would decorate it with snow flakes and crystals hanging from each level, with snow men and christmas trees and put a cute winter decoration on the cupcakes. I would spray paint it pink and put a sparkly pink ribbon around the edges. then i would put butterflies and diamonds and bowson the tower, finally i would put rose and flower decorated cupcakes onto the tower. and of course use glue dots or double sided tape so i could keep decorating it over and over. I’d use pink and blue ribbon to go around the edges of each tier and dress it up with cupcakes! I would go with a cotton candy and bubble gum theme of course! With classic blue and pink colors! I’d really like to win! Thanks! So many possibilities, I would make it universal so it can always be used for any event. I would put a pearl color bead all around the edges of all tiers. Add color from the cupcake wrappers and decorations, I absolutely love cupcake wrappers they add an amazing touch to cupcakes and you can do to all occasions. I have a cricut machine that I cut my own cupacke wrappers with I did my daughters Grad party in them with her school colors it was the talk of the party. also on the top I would do a cake sized cupcake with the bottom of the large cupcake done in fondant in the color of what ever the occasion is and decorated to the occasion too. I think I would make is super girly by painting it pink and covering the edges in rinestones, then maybe a glaze with glitter, super girly! I would decorate it candy land style for my daughter’s candy land birthday party next month! Would leave as is for multiple uses. For first decoration, however, I would drape hot pink and black tulle and add heels and purses for my birthday next month. I would make it look like a ski hill…maybe little skis on each cupcake and a chairlift sitting at the top! Perfect for a wedding in the mountains. Greenery with cupcakes nestled in and among it. Adorable! I’m so happy to find your site. I’ve been looking for a cupcake stand but the larger ones I’ve found are so expensive. I like your reasonable pricing! I’ve decided I will need two: one to use as a display at wedding shows and one (at least) for my brides. How would I decorate? With cupcakes, of course! :) But beyond that I would love to use a decoupage technique I learned at a scrapbooking class by applying different colored polka-dot paper on the platforms. On the edges I would put ribbon, a different color on each edge that would coordinate with the paper. The cupcakes would match with a gumpaste daisies on each (each with a different color center). So fun! I love these! They are a blank canvas just waiting to be personalized to each event! I need to get one of these so badly! I would decorate it according to whichever event I was using it at, but one specifically would be a wedding I’m doing cupcakes for in October. I don’t have a stand yet and can’t really afford one right now. For this wedding, I would line the shelves with Black and White Demask contact paper I found, that way its easy to take off and redecorate- I would line the edges of each shelf with diamonds (clear rhinestones), and make a gorgeous black tulle skirt for it. I would then decorate it with decadent Red Velvet cupcakes in Sutton Gourmet Papers Black and White Demask liners (theirs are the best!) and top them with my delicious Cream Cheese Buttercream, and decorated with edible Diamonds! I have SOOO many ideas but I’ll just post the one! I can’t wait to get my hands on one of these! I love to create, and am in desperate need of a stand! In the emperor’s new clothes, one clever man created the outfit upon which everyone could bestow their own vision. Should I be so lucky as to win the emperor, I would first bestow upon him the colors of the upcoming season, sharing pumpkin cupcakes upon a smattering of freshly pressed fall foliage. As the colder days approach, what a pleasure it would be to present gingerbread cupcakes and Christmas cookies upon a winter wonderland emperor decorated with ice blue foil and sugar snowflakes. And as the days get warmer once again, what an honor it would be to present a miriad of homemade spring-colored cupcakes, like green tea, strawberry kiss, and lavender honey at my approaching wedding, upon an emporer dressed in spring grasses and early April blossoms. Indeed what a treat it would be to be the lucky cupcake! I would modpodge vintage book paper (or shhh a printed lookalike) on it, and add a beaded pearl trim to the edges! Ta-da! Ready for cupcakes! I would paint it Tiffany Blue, then cover it in doilies to let the color show through in a delicate way. The cupcakes would look so dainty! Well of course I’d decorate it with cupcakes! I make cupcakes for all sorts of family functions. I actually have my nephews 1st birthday and my daughters 1st birthday (3 months apart) that I’m planning and doing cupcakes for both of those. And my wedding is going to have cupcakes. Winning this would be perfect timing! My son just asked his girlfriend of three years to marry him. This would be great to decorate for their engagement party and her bridal shower. They’re going to get married on the beach, so that would be theme I’d go with. Making each shelf appear to be a sandy beach. Maybe some “waves” along the outer perimeter of each shelf. The assorted cupcakes could have some beach decorations like chairs, flip flops and umbrellas. The possibilities are endless! Since I usually put my cake pops in little white paper cups, I would leave the tiers white but I would use a decorative ribbon all the way around the tier circles. Then I would fill it with colorful cake pops and maybe a ball of flowers or a giant cupcake on the top tier. Every year I hold a X-mas Cafe for all of my beautiful women friends. A time to share sisterhood. I would drape the tower in an Ireland green Duppioni (a type of silk) cloth (it would be ‘tucked in when cupcakes are placed on each of the tiers) and place cupcakes of different colors resembling christmas tree ornaments. On the top would be 4 star shaped cupcakes covered with silver cake dusting…..Voila, a gorgeous, sophisticated Christmas tree. I would totally BLING it out for all the Princess parties we do! The little princesses would love it!!! I’m getting married in March 2012 and my colours are ivory, black and gold and so to decorate this I would put a black satin ribbon edging on each shelf. I would ruffle up some pale gold organza around the bottom of the stand with some very fine fairy lights and gold diamante crystals. It would then have approx 150 cupcakes on which are in black lacey liners, topped with ivory creamy buttercream and alternating butterfly, flower and heart on top. I would some ivory rose heads placed at the bottom of the stand and between some of the cupcakes in cases. And then an ivory cake on top decorated with little black flowers. My niece is turning 1 next month & I would love to win this so I could use it for my her cupcake themed party. It would be decorated with cute cupcake ribbon w/ a giant cupcake on top. Forgot to say I would also spray the stand a subtle glittery gold. I would decorate it with some rockin’ Pink and Black decorated cupcakes and sneak in some matching flowers as well. Maybe dress it up a little with some ribbon or beads. I would use some velcro cut down to go along the edges that way I can change it to go with the event or holiday!!! I could use ribbon one time and the next time maybe a little ruffle! The best decorations need inspiration! So I would get mine from the event and cupcakes. Ribbon and tulle is basic and easy. Thanks for the great giveaway! I would decorate it in fall colors for the bake sale my church is having in late October. My daughters 1st birthday is come up, we’re having a pink dinosaur party! This would be perfect! We could put her smash cake on top, which is a dinosaur egg, and then all the little dinosaur cupcakes on the bottom!! It will be perfect! Penguins, Igloos, Ice cubes, cotton candy, many many cupcakes! Oh..it just gets me excited thinking about it! Thank you for the chance to win! I started a cupcake business from my home this year and my best friend Megan is my right-hand girl. I’d love to win this tower so I can repay her for all her help by doing a cupcake tower for her DIY wedding in April. The budget is super tight but she deserves a fabulous cupcake display! I was thinking about painting it with a big gold glitter that would really pop on the stark white. Maybe an ombre look with more glitter on the bottom layers and less on the top. I WOULD PAINT IT A PRETTY SEA BLUE TO MATCH MY BEACH THEMED PARTY FOR MY LITTLE GIRL IN FEB WE ARE GOING TO BE USEING CUP CAKES ADOREND WITH TEDDY GRAMS IN TO MAKE BEACH THEAMS PLUS IT COULD BE USED OVER AND OVER EACH YEAR AND FOR EVERY THIGN IT A WONDERFUL DEAL AND COULD BE SO VESITAL ! I’d give it to my college-aged daughter to use with her cupcake creations. She’s enjoyed making cupcakes for all her college friends during her time there. . . birthdays, football tailgates, volunteer groups, and now friend’s weddings! i would prepare it for my daugthers 5th birthday coming up in 2 months. Barbie theme cupcakes so barbie theme tower. I would paint light pink ad hot pink. The add some pink pock a dotted ribbon on the edges of each circle. And some tull going arround “u” stylee with small diamond circles arond and viola there it. I already pictuure it. I would spray each tier a different colour of the rainbow to represent autism awareness and fill it with cupcakes at my autism support group next month. Each tier of cakes would have a different colour theme with jigsaw puzzle piece toppers. I would have it all light lovely pink. Then adorn it with tiny fabric roses and sage-green leaves. This Cupcake Stand is really nice! Thanks. First I would laminate different wrapping paper (something for birthdays, Christmas, Fourth of July, etc). Then cut it out to cover the face of each tier. Then I have something that would easily work for each event we are celebrating, without having to spend a lot of money. It wold easily store in a folder too. Since it’s laminated it would wash clean with a wet peper towel. It would be a great asset to help start my cupcake business. Having an awesome cupcake display would enhance and show off the delicate scrumptious cupcakes. I would decorate it with some fabric and ribbon and matching cupcakes of course!! I would decorate with ribbon and flowers to match! Spray paint it black so your frosting colors will POP against the background! I would do something pink and girly for my daughter’s first birthday party!! I would cover it in leaves and sticks for our fall themed wedding. and sparkle .. lots of sparkle. a mix of cupcakes and candy apples would look amazing on a stand like that !! I would spray paint it a bright pink and probably add some sparkly ribbon to the edges. Or I might just decoupage it with some pretty scrapbook paper. I’m not sure – the possibilities really are endless! Thank you for a chance to win it! I am just so excited about this. I will be decorating this for my sister’s wedding. I will cover the edges in a deep purple ribbon first. Then I will use miniature white lights to go around the edges over the purple ribbon so that they point downward. I will then use tulle over top of that for a soft romantic look. The cupcakes will be standard size and miniature decorated with white and lavender icing, purple orchids and silver nonpareils. On top will be a small cake decorated with fresh purple roses and white calla lilies just for the bride and groom. I appreciate this opportunity to share and maybe win. Thank you! If i had the chance to win this cupcake stand I would decorate it with white and pink ribbon on the sides and put pink glitter all over the bottom. Add a mini Pink and White cake that says “SURVIVOR” on it on the top, and on the bottom i would add my famous lemon mini cupcakes that have breast cancer bows. When i would give it to my mom, I would give her some pink and white ballons to match the cake!! Winter wonderland is my babygirls theme to her first birthday, I’d put light blue material on the shelves and with white snowy looking cotton around the edges and make each shelf look like there’s icicles forming and have them hanging off each shelf. This is an amazing cupcake tower. I love it that is so versitle and can be decorated in so many ways. I have a very special party in a few months and I would decorate it with lace and navy and pink ribbons. My cupcakes will be in navy papers, frosted with vanilla buttercream and sprinkled with pink sugar crystals. It would be absolutely beautiful ! !